This is a difficult interview for me. It was Noam Chomsky who first opened my eyes to the basic neo-colonial structure of the world, and to the role of the corporate media in both disguising and legitimising this structure. Chomsky has consistently demonstrated how, ever since the end of the Second World War, military regimes have been imposed on the third world by the US and its European allies with an ascribed role to keep wages low (and thus investment opportunities high) by wiping out communists, trade unionists, and anyone else deemed a potential threat to Empire. He has been at the forefront of exposing the lies and real motives behind the aggression against Iraq, Afghanistan, and Serbia in recent years, and against Central America and South East Asia before that. But on Libya, in my opinion, he has been terrible. Don’t get me wrong; now the conquest is nearly over, Chomsky can be quite forthright in his denunciation of it, as he makes clear during the interview: “right now at this moment NATO is bombing a home base of the largest tribe in Libya” he tells me, “It’s not getting reported much, but if you read the Red Cross reports they’re describing a horrifying humanitarian crisis in the city that’s under attack, with hospitals collapsing, no drugs, people dying, people fleeing on foot into the desert to try to get away from it and so on. That’s happening under the NATO mandate of protecting civilians.” What bothers me is that this was precisely the mandate that Chomsky supported. Wesley Clark, NATO commander during the bombing of Serbia, revealed on US television seven years ago that the Pentagon had drawn up a ‘hitlist’ in 2001 of seven states they wanted to “take out” within five years: Iraq, Syria, Lebanon, Libya, Somalia, Sudan and Iran. Thanks to the Iraqi and Afghan resistance, the plan has been delayed – but clearly not abandoned. We should, therefore, have been fully expecting the invasion of Libya. Given Bush’s cack-handedness over winning global support for the war on Iraq, and Obama’s declared commitment to multilateralism and ‘soft power’, we should have been expecting this invasion to have been meticulously planned in order to give it a veneer of legitimacy. Given the CIA’s growing fondness for instigating ‘colour revolutions’ to cause headaches for governments it dislikes, we should have been expecting something similar as part of the build-up to the invasion in Libya. And given Obama’s close working relationship with the Clintons, we might have expected this invasion to follow the highly successful pattern established by Bill Clinton in Kosovo: cajoling rebel movements on the ground into making violent provocations against the state, and then screaming genocide at the state’s response in order to terrorise world opinion into supporting intervention. In other words, we should have seen it coming, and prominent and widely respected intellectuals such as Chomsky should have used their platform to publicise Wesley Clark’s revelations, to warn of the coming aggression, and to draw attention to the racist and sectarian nature of the ‘rebel movements’ the US and British governments have traditionally employed to topple non-compliant governments. Chomsky certainly did not need reminding of the unhinged atrocities of the Kosovo Liberation Army, the Nicaraguan Contras, or the Afghan Northern Alliance. Indeed, it was he who helped alert the world to many of them. But Chomsky did not use his platform to make these points. Instead, in an interview with the BBC one month into the rebellion – and, crucially, just four days before the passing of UN Security Council 1973 and the beginning of the NATO blitzkrieg – he chose to characterise the rebellion as “wonderful”. Elsewhere he referred to Benghazi’s takeover by racist gangs as “liberation” and to the rebellion as “initially non-violent”. In an interview with the BBC, he even claimed that “Libya is the one place [in North Africa] where there was a very violent state reaction repressing the popular uprisings”, a claim so divorced from the truth it is hard to know where to begin; Mubarak is currently being prosecuted for the murder of 850 protesters, whereas, according to Amnesty International, only 110 deaths could be confirmed in Benghazi before NATO operations began – and this included pro-government people killed by rebel militia. What really makes Libya exceptional in the North African ‘Arab Spring’ is that it was the only country in which the rebellion was armed, violent, and openly aimed at facilitating a foreign invasion. Now that Amnesty have confirmed that rebels have been using violence since the very start, and have been rounding up and executing innocent black Libyans and African migrants in droves ever since, I begin by asking him whether he now regrets at his initial public support for them. On most of this we agree. My argument, however, is that it was painfully clear that UNSC 1973 was intended (by the ‘imperial triumvirate’) as a figleaf for precisely the “second intervention” he decries. It seems bizarrely naïve for a man of Chomsky’s insight to feign surprise when the imperial powers used UNSC 1973 for their own purposes to topple one of the governments on their hitlist. What else would they have used it for? It is somewhat exasperating; if it was anyone else I was talking to, I’d tell them to go and read some Chomsky. He would tell you that the imperial powers don’t act out of humanitarian but totalitarian impulses – to defend and extend their dominance of the world and its resources. He would tell you – I would have thought – not to expect them to implement measures designed to save civilians, because they would only take advantage and do the opposite. But apparently not. I try again: Does Chomsky accept that his whitewashing of the rebels, and demonising of Gaddafi, in the days and weeks before the invasion was launched, may have helped to facilitate it? Even after British, French and US aggression had become abundantly clear, however – on April 5th – Chomsky published another article on Libya. By this time thousands - if not tens of thousands - of Libyans had been killed by NATO bombs. This time his piece did open by criticising the British and American governments – not for their blitzkrieg, however – but for their alleged support for Gaddafi ‘and his crimes’. Does this not all feed into the demonisation that justifies and perpetuates NATO’s aggression? I can’t help wondering why the responsibility to “tell the truth about what’s happening” only applies to Libya. Should we not also tell the truth about what is happening in the West? About its unquenchable thirst for diminishing oil and gas reserves, about its fear of an independent Africa, about its long track record of supporting and arming the most brutal gangsters against governments it wants removed – and god knows, Chomsky is familiar enough with the examples – and most importantly, about the crisis and chaos currently enveloping the entire Western economic system and leading its elites increasingly to rely on fascistic warmongering to maintain their crumbling world dominance? Isn’t all this actually a lot more pertinent to the war on Libya than recounting alleged ‘crimes’ of Gaddafi from twenty years ago? Chomsky had an argument with James Petras in 2003 over Chomsky’s public condemnation of Cuba’s arrest of several dozen paid US agents and execution of three hijackers. Petras argued then that “Intellectuals have a responsibility to distinguish between the defensive measures taken by countries and peoples under imperial attack and the offensive methods of imperial powers bent on conquest. It is the height of cant and hypocrisy to engage in moral equivalences between the violence and repression of imperial countries bent on conquest with that of Third World countries under military and terrorist attacks.” But Chomsky has done worse than this – far from painting moral equivalences, for a long time he simply airbrushed out of the picture ALL crimes of NATO’s Libyan allies, whilst amplifying and distorting the defensive measures taken by Libya’s government in dealing with an armed US-backed rebellion. It’s a lot less “nice” now. This article first appeared in Al Ahram Weekly. 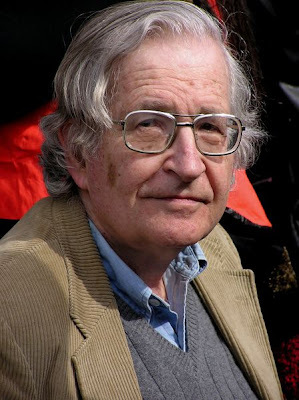 I too was a student of Chomsky who held him in high esteem, but I was very disappointed when he was sung to sleep by the very same lullaby he had been warning us about for years. Libya is now a mess with the possibility of years of conflict ahead of it. When will we say enough of war? Great piece! It would be useful for those of us interested in accuracy if you could publish a full transcript of the interview, with complete questions and answers, separate from your own comments and thoughts. I would have been far more impressed if you had provided any direct quote whatsoever from Chomsky or even cites to the articles or interviews you use to defame him.